Listed real estate investment trust (REIT) Redefine Properties (JSE: RDF) continues to weather challenging economic conditions by building a robust asset platform to sustain and nurture organic growth, both at home and abroad. A relentless focus on driving operational efficiencies during a tough period for markets, which were buffeted by ongoing global trade wars and SA's first recession in a decade, saw Redefine buck the trend to achieve impressive recurring income growth of 6.9% and an improvement in overall occupancy to 95.5% for the year ended 31 August 2018. 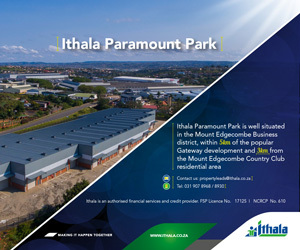 Several well-timed and value enhancing strategic investments saw property assets under management expand by R7 billion to R91.3 billion, with international real estate investments now making up 20.7% of the portfolio, from 19.0% this time a year ago. Off the back of gross distributable income growth of 8.2% to R5.2 billion - this is the first time the R5 billion mark has been breached - total distribution for the year lifted 5.5% to 97.10 cents a share, in line with market guidance. Net asset value per share recorded pleasing growth of 5.9%. "Almost every sector in the economy is under huge pressure and everyone is feeling the pinch. However, we are up for the challenge and will continue deploying capital in SA and abroad, developing properties that are well located, with strong upside potential," says Redefine CEO Andrew Konig. Redefine remains firmly focused on broadening sustainability to remain relevant by continuously improving, expanding and protecting its domestic portfolio, unlocking value from active asset management opportunities in offshore markets and recycling capital through the sale of assets at the end of their investment cycle. "Conditions will remain challenging for the foreseeable future, despite some positive signs like the appointment of a new finance minister and commitments made to creating jobs and growth by government and the private sector. Global economies are slowing and remain unpredictable due to the US policy of raising interest rates and ongoing trade wars, with geopolitical tensions on the rise. This all impacts capital flows and general confidence. Confidence will not pick up until we see more catalysts for change," says Konig. For Redefine, navigating the storm means phasing out non-recurring, "lumpy" income, but Konig says this must be done in a measured way through considered acquisitions over a period. He says significant focus is placed on core income growth and maintaining margins. "The leasing environment will continue to be challenging and we need to be creative, smart and optimise costs, while attracting and retaining the best staff." Redefine remained very active on the development front during the year, with R5.3 billion deployed into total development activity - notably via an expansion into the exciting and fast-paced logistics sector in Poland. A highlight during the reporting period was the R8.9 billion being realised through the recycling of capital via the sale of secondary assets, with the Northpoint and Cromwell sales alone fetching R5.2 billion. Capital was deployed by expanding offshore through investments into a logistic platform in Poland, acquiring shares in listed EPP and developing student accommodation facilities in Australia, while locally, acquiring the remaining 50% share of 115 West Street for R751 million and developing / redeveloping and expanding well-located properties to the tune of R4.7 billion. "Given the volatile times and the economic constraints both locally and abroad, balance sheet management is critical. We placed a lot of emphasis on credit metrics and this will stand us in good stead as it is anticipated that the macro-economic environment will remain volatile," says Redefine Financial Director, Leon Kok. Cost of debt reduced by 100 basis points to 6.3%, gearing and loan to value was lowered to 40% and interest rates were hedged on 81.2% of total debt for the reporting period. Kok says the operating cost margin improved to 33.5% of contractual rental income, with enhanced operational efficiencies leading to a total operating margin improvement to 82.3%. International property investments contributed 24% to distributable income during the year. Growth in distributable income for 2019 is expected to range between 4% to 5%. Meanwhile, several new board appointments were made during the year to broaden diversity and skills. Marc Wainer will remain Redefine's executive Chairman until an independent non-executive Chairman is appointed. Further changes to the board, effective from 2 November 2018 include: independent non-executive directors David Nathan and Phumzile Langeni have stepped down from the board and Bernie Nackan has indicated that he will not stand for re-election at the next annual general meeting. "We thank them for their valuable contributions during their terms of office and wish them well in their endeavours," says Konig. "Volatility can be expected to continue against a less supportive economic backdrop. We need to keep our heads up, hearts in and hands on to focus on what matters most. We continue to drive initiatives to foster a values-driven service culture, while embracing change and encouraging innovation. We believe our strategic approach is appropriate for the environment in which we are operating - but we continue to expect the unexpected," concludes Konig.